In this 3rd pAsuram, nammAzhwAr says that the glories of the confidential nature of the birth/appearance of srIman nArAyaNan who is the supreme lord is incomprehensible even for brahmA, etc., who are greatly knowledgable. Subsequently, nammAzhwAr says that the avathAra rahasyam (the confidentiality of bhagavAn‘s births) cannot be understood by any one. In the first pAsuram, AzhwAr said bhagavAn is eLiyan (very simple). In the next pAsuram, his simplicity was elaborated. In this pAsuram, AzhwAr says that his avathAra rahasyam cannot be comprehended by any one. yAr aRibavar – who knows? dhEvas such as brahmA, etc., have dharmam (virtuous path) that lead to proper result, have attained high position to be engaged in creation, annihilation, etc and are very capable/intelligent. Even such dhEvas starting with brahmA cannot comprehend the magnificient nature of the incarnations of the most apt (for being the supreme lord) srIman nArAyaNan who sustains all chEthanas (sentients) and achEthanas (insentients). Similar to vAdhi kEsari azhagiya maNavALa jIyar‘s vyAkyAnam (simple translation). amaivudai aRaneRi… – The path of dharmam which leads to the result surely like dhasaratha chakravarthy performing yAgam and soon benefiting with 4 gems (4 children). Like bhagavAn is complete in auspicious qualities, brahmA, etc., are complete in virtues. amaivudai muthal kedal… – When brahmA creates, everyone wonder if creation was done by bhagavAn himself – he is so meticulous. Same with samhAram, etc. This also includes avAnthara samhAram, etc (intermediate annihilation, creation, etc). Note: brahmA lives for 100 years of 360 days each. There are innumerable brahmAs. Under each brahmA, 14 lOkams exist. Each day of brahmA, there are 1000 chathur yugams. At the end of brahmA’s day – during the night, there is no activity. At the end of brahmA’s life, there is mahA praLayam (everything is consumed by bhagavAn). The 1000 yugams are divided in to 14 manvantharams (about 70 chathur yugams approximately) – each manvantharam has one indhra, one manu, saptha rishis (seven rishis), etc. At the end of each manvatharam, upto svarga lOka (5th lOkam from coming down brahma lOka) is dissolved and a new set of 10 lOkas get created again. This could be called as avAnthara praLayam and avAnthara srushti. At the end of each chathur yugam also, lots of annihilation occurs at various locations and dharma will be re-established through fresh progeny. This could also be called as avAnthara praLayam and avAnthara srushti. aRa nilam adhuvAm – top-most virtue. brahmA, etc., are so capable that they need not hear the instructions from bhagavAn even for a second time. They become very obedient and submissive on learning their tasks from bhagavAn. thAnAm amaivudai nAraNan – being the antharyAmi for all chith and achith – bhagavAn is the prakAri (object) and they are all his prakAra (forms/attributes). 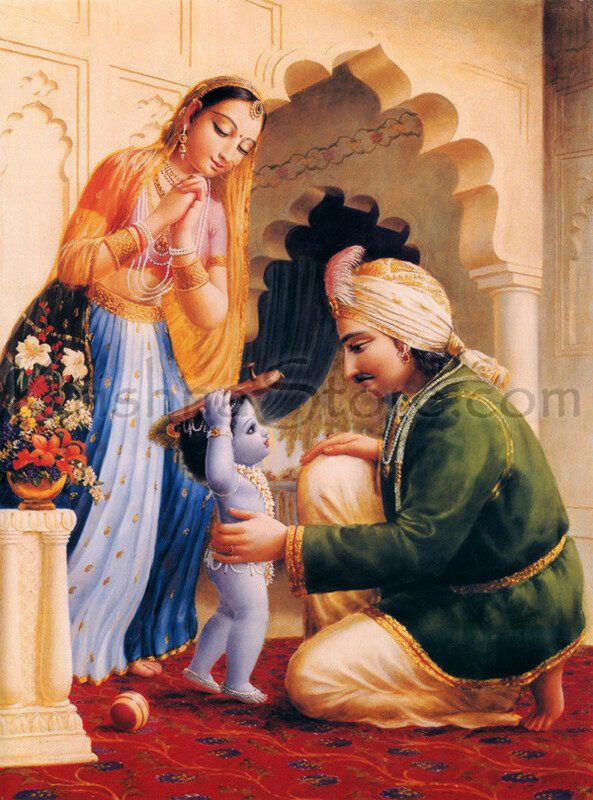 mAyaiyai aRibavar yArE – It is so difficult to comprehend because he chose to be born as the son of nandhagOpa who is one of his prakAram (form) and made him consider that “this is my son”. aRibavar yArE – Who can comprehend this greatness? No one can. nithyasUris cannot comprehend this since they are fully engaged in enjoying emperumAn in paramapadham. samsAris cannot comprehend this since they dont have faith in emperumAn. brahmA, etc., are depending on self-effort, so they cannot comprehend this unlimited greatness of emperumAn. AzhwArs who are blessed by emperumAn himself, cannot comprehend this since they are immersed in enjoying such emperumAn in these incarnations and they cannot come out of it to comprehend it. The omniscient lord himself cannot comprehend this since he himself says in bhagavath gIthA 4.9 “janma karma cha mE dhivyam” (my birth and activities are so divine that I myself is bewildered thinking about them). This entry was posted in thiruvAimozhi, thiruvAimozhi 1st centum on June 20, 2015 by Sarathy Thothathri. Thanks for the feedback. It is true that no literature can be reproduced with the same elegance and beauty in a different language than what it is written in. * To cater to the devoted srIvaishNavas who do not understand thamizh, yet wanting to get a glimpse of dhivya prabandham. * To create the taste for listening to proper grantha kAlakshEpams by getting a glimpse of the beautiful meanings. * To document the great works of AzhwArs/AchAryas in English and other languages for academic purposes. For those of us learning under an Acharya, this lovely summary is an excellent resource to understand the full import. If not translated in English do you want non-tamilians to suffer in darkness? There are thousands of bhaktAs who are looking forward translate this great divine work to other languages. Sri Sarathy swamin is doing an outstanding job. Thanks.